A Day for Ducks and Drowned Rats – Run. Ride. Roam. With the plan to ride on to Florence today, we spent some time last night looking at weather forecasts. Every site we looked at said there was going to be rain and storms, they just all said a different thing about when the rain and storms were going to start and finish. 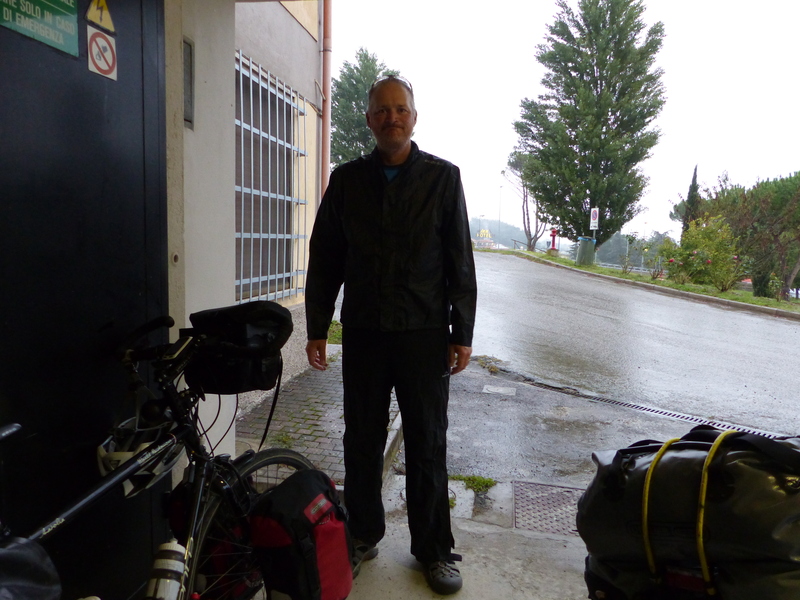 We tried to plan a departure time to make it the short distance to Firenze, before the worst of the weather, but in the end we decided we were bound to get wet one way or another, so just ride and take what comes. 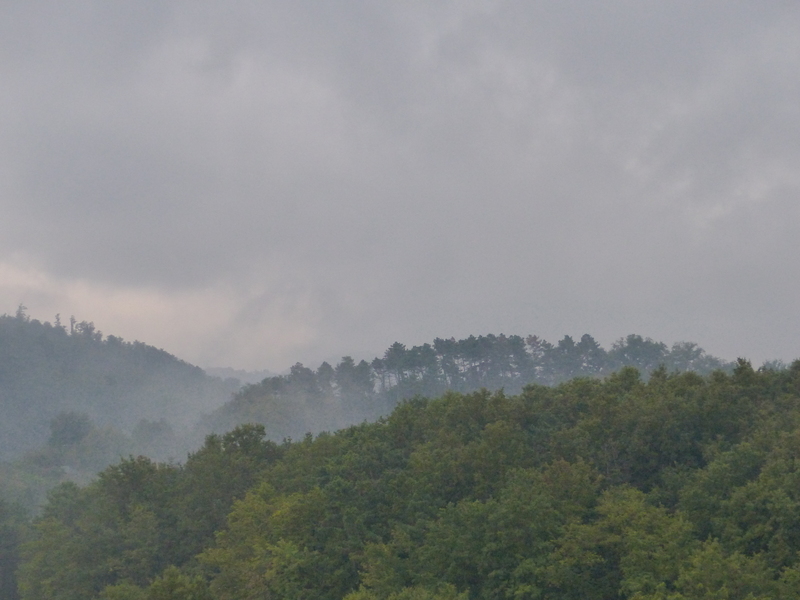 We were greeted first thing this morning with rain. OK, that answered that question, we were clearly going to be riding in the rain again right from the start. No worries. Thar’s rain in them thar clouds! We zipped into our slicks, Ira was ready for action, we loaded up the bikes and set off in the rain that was light enough to be annoying, but not too heavy as to be drenching. Slicked up and ready to ride! There’s a reason why Steve isn’t in his usual blue raincoat. That’s another story! That situation lasted all of about two minutes though. No sooner had we left the basement of the hotel than the rain really came down. I mean CAME DOWN! It bucketed, with big fat rain drops that were splonking on the road and splatting on us. 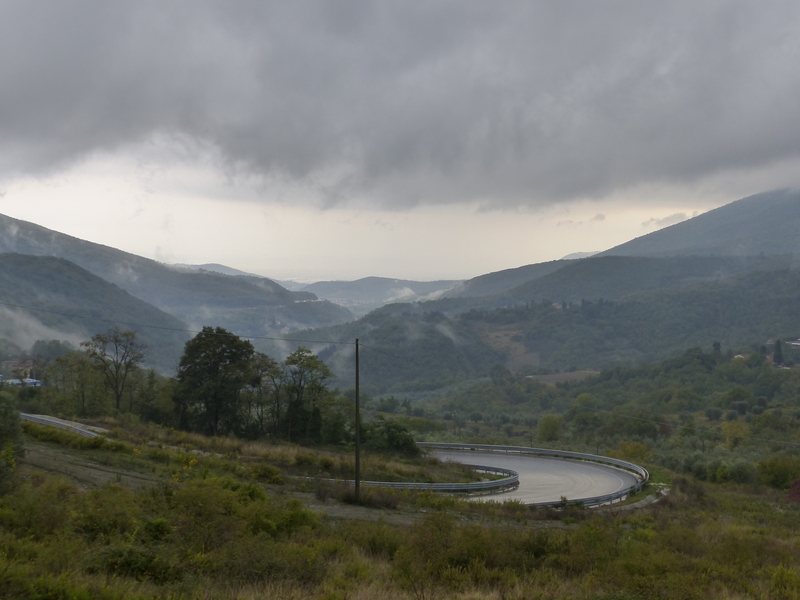 On top of that, the first 6km out of Barberino di Mugello, was a solid uphill climb, which of course slowed us down, which of course made us sitting ducks for those kerplunking rain drops, which were heavy and relentless. We had rivers of water flowing down the hill towards us, and big puddles from overflowing drains creeping out on to the road for us to dodge or splash through. Up we climbed…whoosh went the trucks beside us…sploosh went the cars beside us…up went the waterfalls of spray from the wheels of the trucks and cars beside us! It was wet from every direction! The rain came down, the traffic spray came in from the side, the puddle spray came up from below and even, just for me, because I kept riding too close behind Steve, over came the waterfall of spray from his back wheel, on to me! Wet was the word of the day! There comes a time in those situations though, where you become so saturated and so uncomfortable and look and feel so ridiculous, that it all just becomes fun! That’s actually what it was…just fun! We were drenched and heaven only knows what the drivers must have thought of these two brainless cyclists, pedalling along in the never-ending downpour, as if they were out for a pleasant summer’s ride! Up we went, climb, climb, climb. It was bit mean of the hill to throw that at us, with the legs still feeling a bit tired from yesterday’s long day of slogging up hills. Still, the legs still fired and managed to hall us, and the load, up that never-ending slope. 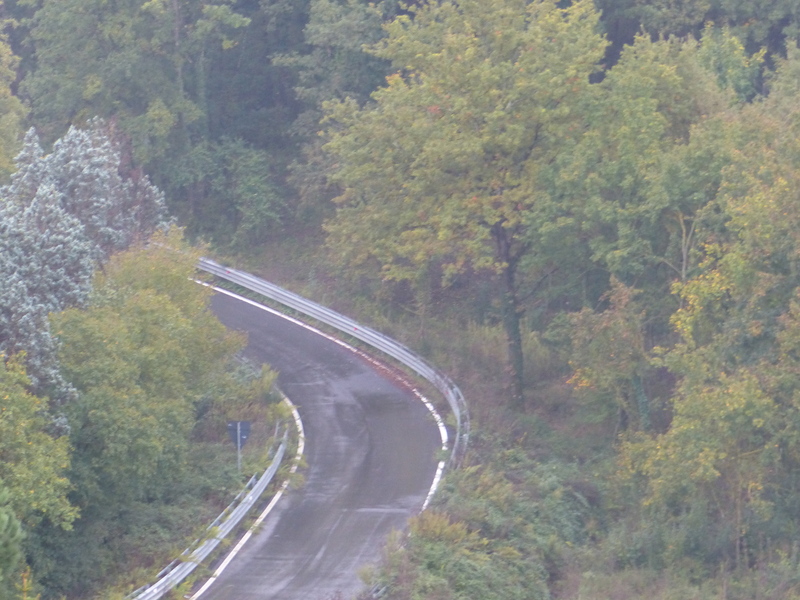 After the long climb, we got to the top and then had a long, long downhill run into Florence. That was ripper! The downhill was broken up by some flat stretches, which were just enough for us to need to pedal and that kept the muscles warm and stopped the legs freezing into their downhill position. We’d been on a highway all the way, with busy traffic, but for once, a lot of the road was new so we didn’t have too many cracks and holes to contend with and we got a shoulder to ride in too, so we could get a little bit of distance between us, the traffic, and the waterfalls flying off their wheels. Yay for the downhill! Is that some “brightening” I see before me!? 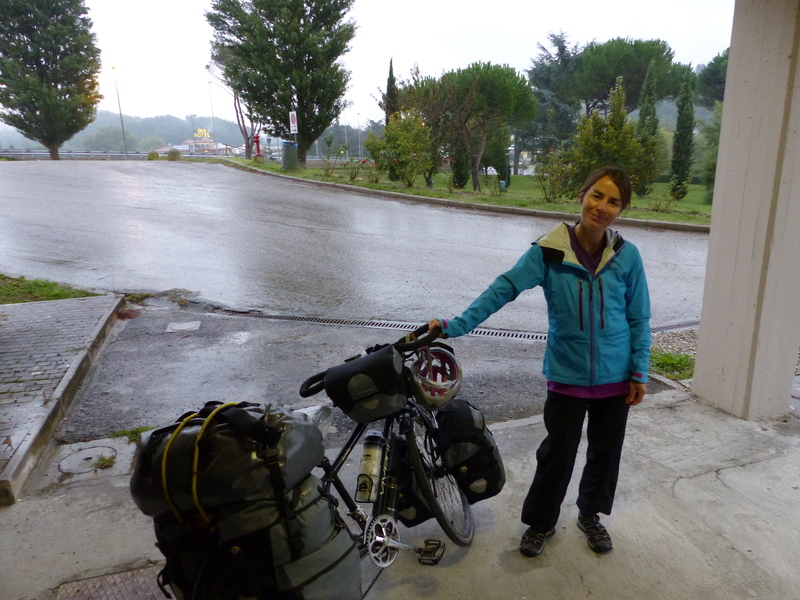 We’d chosen a hotel on the outskirts of Florence, so we could keep our ride short, if the weather was wet, which it had turned out to be! We arrived about 10:00am, with check-in not until 2:00pm. 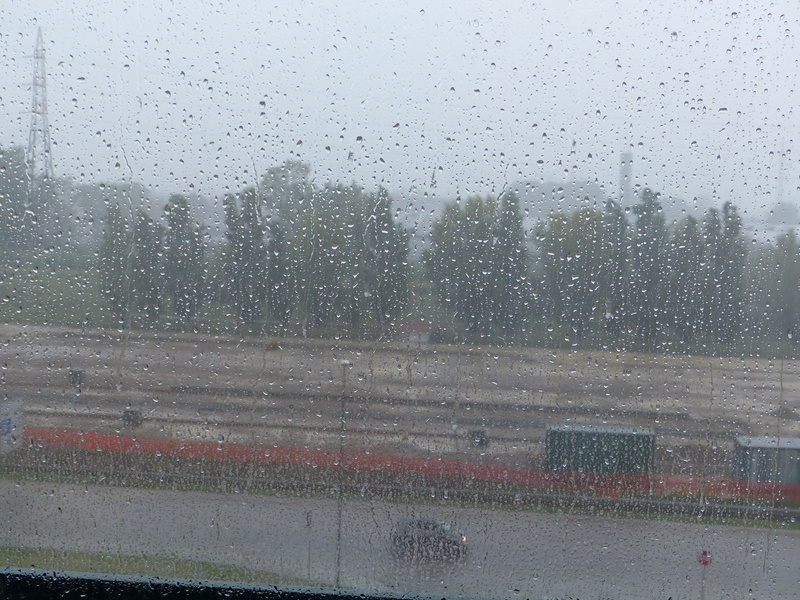 It was still pouring, so we stopped in the entrance to a shopping centre, next door to the hotel, to get some shelter. “Do you want to walk over to the hotel and just see what the earliest time is we can check in?” I suggested to Steve. “Or at least if we can store the bikes,” he added. So in the end, Steve wandered next door to the hotel, while I waited with the bikes, joined by the constant stream of smokers sitting outside in the damp to have their ciggie and making me an unwilling passive smoker. I considered shaking myself like a soggy St. Bernard, to make the seat beside me so damp, that none would want to join me, but my manners prevailed. Steve eventually returned, with a solid thumbs-up. 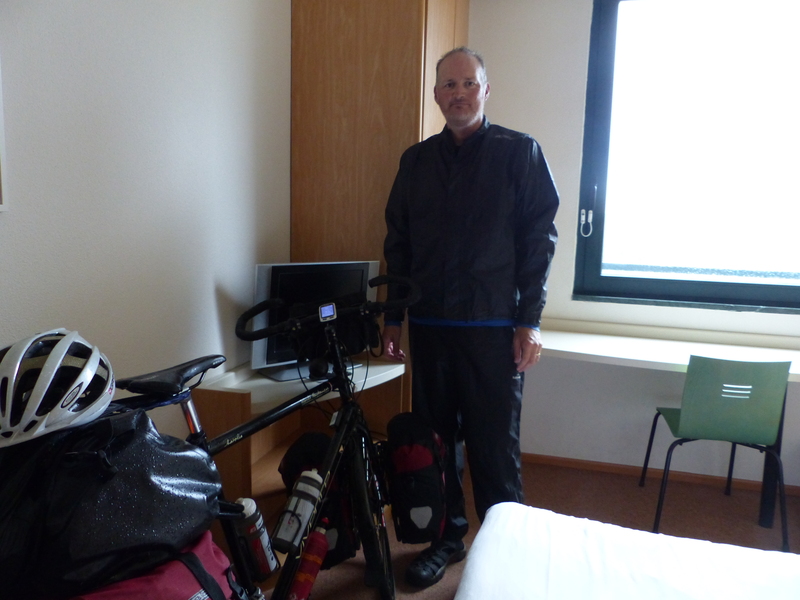 Our champion of a hotel had let us check in almost four hours early and we now had somewhere warm and dry to head to. Thank you Ibis! Good on you! 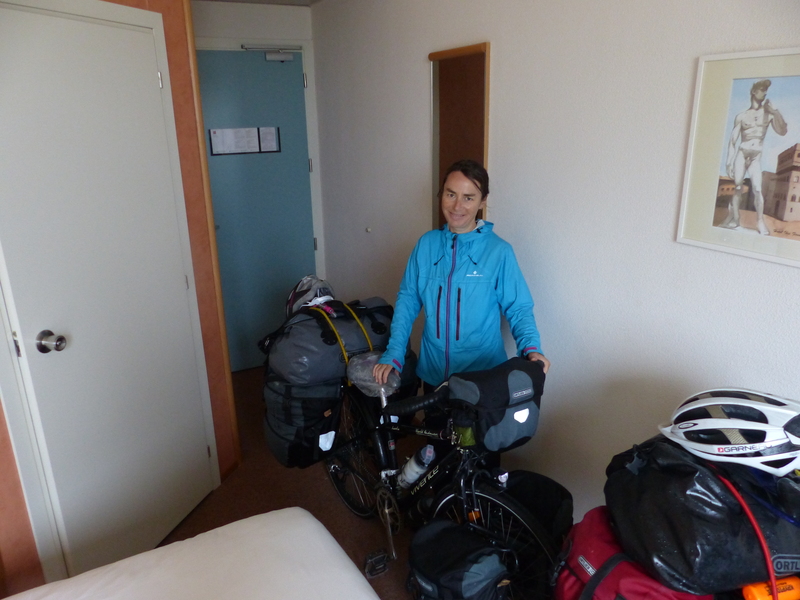 When we entered the lobby, I was about to do my embarrassed, head down scuttle to a space to unload the bikes, but we discovered that the bikes would actually fit, fully loaded, into the lift. We’d been allowed to keep them in our room, so we power-walked across the floor, past the nice, respectable, dry and and civilised guests and fell into the elevator, bikes and all and I was so glad to be out of sight! We wheeled the bikes into the room and my saturated, dripping, squelching self, was finally in the warm, dry, privacy of four small walls. I hit the shower for the second time that morning, (well, second hot shower of the morning, third shower if you count the downpour!) to warm up and try and take the scruffy factor down a notch or two and there and then, the major activities of the day were all over by elevenses! Time to leave a puddle on the carpet! After settling in, we set about turning the room into a laundry, by hanging our wet clothes and gear from every available hook, hanger and door, leaving puddles and damp spots in many places. Then we took a stroll over to the shopping centre to gather some supplies and that was essentially the day. The rain kept up, but we were dry! We knew we were most likely going to have to ride in rain today, by the look of the forecast, but it actually turned out to be the heaviest rain we’ve ridden in so far. It was like riding under a waterfall for 20km, but it was all good fun. I smiled in the downpour and I have no doubt drivers and bystanders had a laugh at us! Hi Heidi. Beautiful Florence! I hope the weather is dry for your time there. I only had a day in Florence, but I remember the magnificent Santa Croce Church in the town square. We did a walking tour of the city which was interesting. We didn’t bother waiting in queues to enter the Ufizzi Gallery to see the original David as there were copies in the square that were good enough for us. Also I remember we stopped at a car park overlooking Florence from a high point over the river with a superb view! There were artists up there too selling their paintings and prints. I didn’t get to walk along the Ponte Vecchio…ran out of time for that. I’ve read about a great tour of the elevated Medici pathways that connected some of the main buildings with chances to look down over the square too. It’s called the Vasari Corridor too I think. It was so the Medici family could walk from place to place without the plebs watching them. I would have liked to spend more time in Florence. Enjoy! Oh Gennie, you’re a champion! Thanks so much for that. Once again you have come up trumps with the travel advice and very welcome suggestions. Thank you! Now all we need is the sunshine!